On a foggy Wednesday afternoon in the north parking lot of Concordia College, a shadowy, disheveled figure is seen poking around in a large campus dumpster. At first glance, it appears to be just a pale, desperate old fellow looking for sustenance from the refuse of others. As we investigate further, that’s exactly what it is. It’s Ted Thompson. While general managers across the NFL are scrambling to score highly prized free agents on the open market, the frugal, passive Green Bay Packer GM is poking about for salvageable values that might have somehow slipped through the cracks. We decided to grab the opportunity for a quick interview. 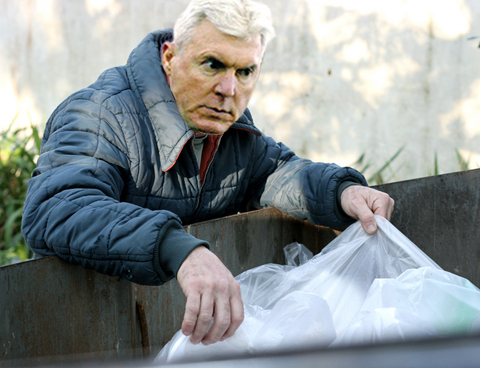 TMN: Mr. Thompson, what are you doing in a Mequon dumpster? TT: I don’t know. Just thought I’d take a look. The St. Louis Rams trained here a couple seasons ago – they may have overlooked something. TMN: Do you really think you’ll find any value by looking for other teams’ discards? TT: Well, that’s one of our plans. We’ve had some success with it before. TMN: Really? Who did you find in a dumpster? TT: I’m not going to name names. But there’s a certain head coach that… well, we didn’t exactly get him out of a Hammacher Schlemmer catalog! TMN: Why don’t you look for first rate talent in the free agent market? You do have some money to spend. TT: Yeah, but if I spend it, I won’t have it anymore. High-priced free agents are a gamble and… hey, wait a minute. I think I see some real talent here! Oh, never mind. It’s Danny Gokey. TMN: Do you really think you can fill all the Packers’ needs with cast-offs and low round draft choices? TT: Sure. We’ll see. Hey, there’s a lot of Chinese drywall in here. Can you give me a hand? TMN: Umm, I’m not really dressed for it. TT: Oh, look! One of those three-ring binders! Coaches love these things. TMN: Looks like one of the rings is busted. TT: Always negative – just like a journalist! Interview is over.